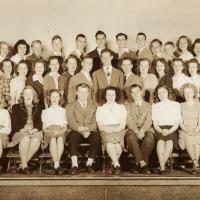 A sepia tinted photo of the Maynard High School Screech Owl Staff in 1946. The Yearbook staff included both Paul and Jean Stein. Paul Stein is seated in the front row, 6th from the left. Jean Stein is standing, last row, 3rd from the left. Audrey Klein-Leach, from the Estate of Jean Stein Brady. 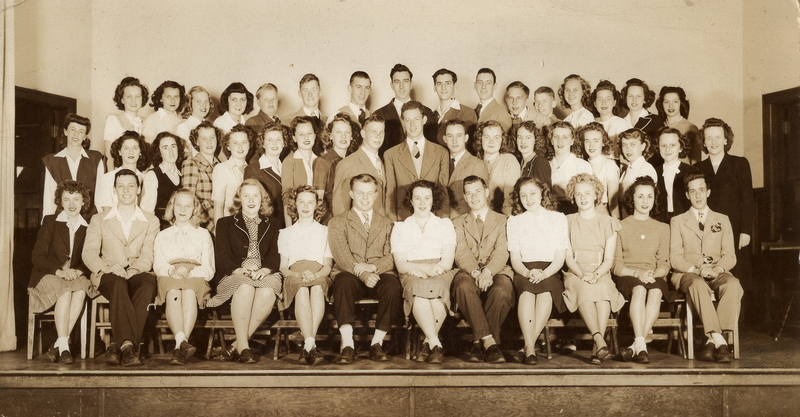 “Maynard High School Screech Owl Staff - 1946,” Maynard Historical Society Archives, accessed April 23, 2019, http://collection.maynardhistory.org/items/show/6333.